The early baptism registers of St Cuthbert, Withington, Manchester in the Diocese of Salford have been released on CD by the Manchester and Lancashire Family History Society. Number 3 is The Bishops’ Register of Confirmations in the Midland District of the Catholic Church in England 1768-1811 and 1816′. Number 4 is The Bishops’ Register of Confirmations in the London District of the Catholic Church in England 1826-1837 and 1843′. 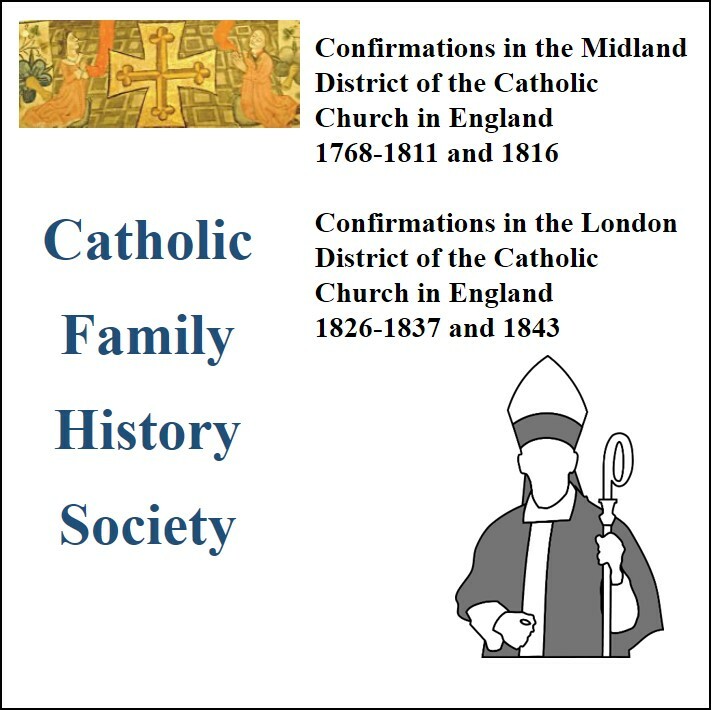 The Manchester & Lancashire Family History Society are delighted to announce the completion of the CD of baptisms for St Chad’s RC Church, Cheetham Hill, Manchester, covering the period 1772-1893. St Chad’s is the Catholic mother church of Manchester with its origins in the mid 18th century, and spawned the daughter parishes of St Mary’s, Mulberry Street (The Hidden Gem), and St Augustine’s before relocating to its present site on Cheetham Hill. The new CD contains transcripts, indexes and original scans of the first twelve volumes of baptism registers and will be an invaluable resource for anybody researching their early Catholic ancestors in Manchester. The CD can be purchased from the MLFHS Bookshop. This blog post is a response by Jim Lancaster to someone who was enquiring about the availability of Catholic record online. It contains a lot of useful information and I have reproduced it verbatim. The period between the reign of Elizabeth and about 1791 is often referred to as the Penal Times and it was a period when it was dangerous to be a Catholic priest in England and therefore dangerous to keep records.Any Catholic records generated could have been used against individual Catholics, or the Catholic community. The main records of Catholics in this period are ‘hostile’ records, records made by the state or its agents the Anglican clergy. It is only from about 1791 that Catholic clergy felt sufficiently confident about civil legislation that mission registers could be maintained. If you are seeking information from these registers, the best place to start is a set of books by Michael Gandy published originally in 1993 that list all the known surviving registers for Catholic missions in the UK for the period 1700 to 1880. Some of these volumes have been revised as old registers have surfaced and more parish registers have been deposited in places of safety.. In the late Victorian time, there were groups in most counties who were transcribing Anglican parish registers, one example being the Lancashire Parish Register Society that is still operating today. There was a move among Catholics to do the same for Catholic registers and this resulted in the formation of the Catholic Record Society. This initially was concerned with the preservation and transcription of Catholic records and among its early volumes are Catholic registers from across England and Wales. Many of these are now out of copyright, particularly outside the UK, and have been made available on the internet. This site is comprehensive but not complete, and you will find that different parts of the country have different densities of Catholics and hence more or less interest in the Catholic community. Different counties may have different facilities. Lancashire is particularly well served. I have mentioned the Lancashire Parish Register Society that has transcribed most of the early Anglican registers. This are the major records of Catholic marriages between 1756 and 1837, though Catholic marriages may not be clearly identified. There is the Lancashire On-Line Parish Clerk Project (http://www.lan-opc.org.uk/ ) which is transcribing parish registers and making them available on the internet. Again it is mainly Anglican church registers that have been transcribed but there are increasing numbers of non-Anglican registers including Catholic ones. For post-1837 births marriages and deaths there is the LancashireBMD site (http://www.lancashirebmd.org.uk/ ). This site is transcribing the Local Registrar’s Indexes and where possible upgrading them. Again it is useful for marriages, though non-Anglican marriages appear as Registrar marriages until an Authorised Person was appointed by the church to act for the Registrar. This became possible in 1898 but was not taken up by many Catholic parishes until 1960+. Clicking on the links above will show the parishes included. 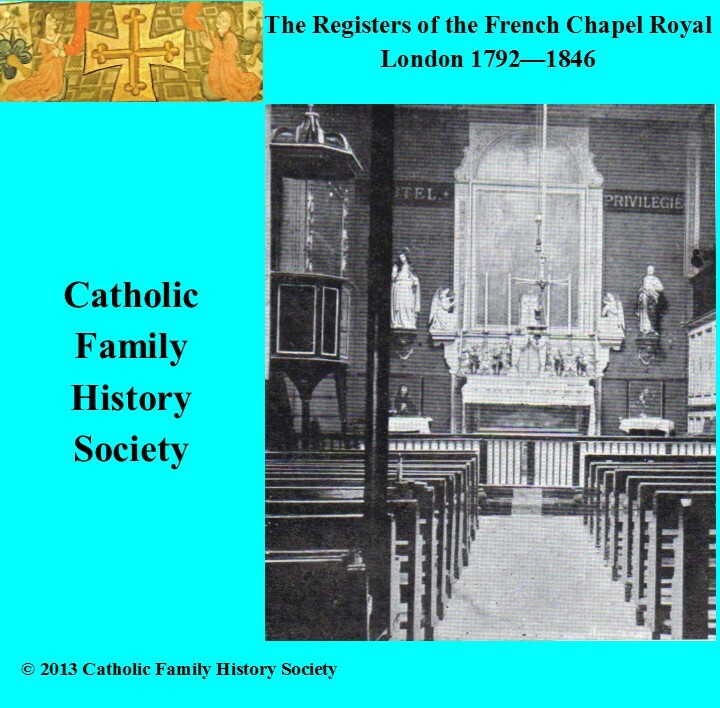 Our latest CD provides the following records of the French Chapel Royal, King St., Portman Sq., London. Burials 1794-1801 and 1813-1814 (65 entries). Records largely relate to French emigrés and their subsequent families. Baptisms are recorded from a number of Hampshire locations as well as in London. The earlier burials are almost all at St Helier, Isle of Jersey, and Winchester, as are many marriages, while those of 1813-14 are at Lymington. Much genealogical data beyond that normally found in such registers is provided. The originals of these registers are held in the French National Archives at Nantes. A filmstrip copy was given to the Archivist of the Portsmouth Roman Catholic Diocese, and this was lodged for safekeeping and for wider access at the Portsmouth City Archives, located at the Portsmouth History Centre. References are provided to enable copies from the filmstrip to be obtained. The transcriptions are provided in both date and surname order, in searchable PDF formats. You can purchase a copy by paying with a credit card here.